Thank you for your interest in one of Lucchetti's Auto Center's online offerings. 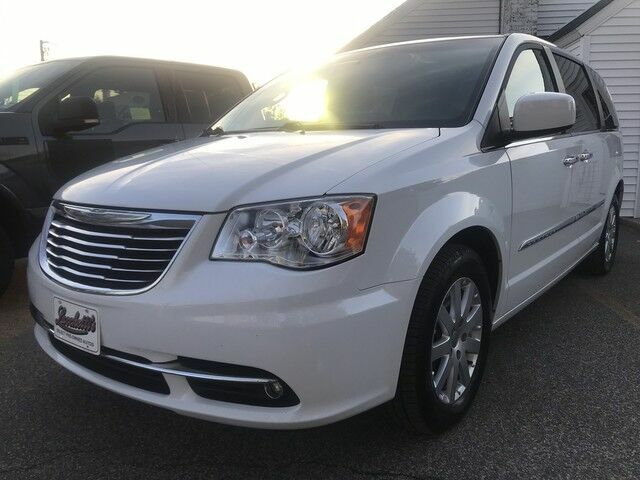 Please continue for more information regarding this 2016 Chrysler Town & Country Touring with 75,161mi. This Chrysler includes: 2ND & 3RD ROW WINDOW SHADES RADIO: 430N Navigation System CD Player MP3 Player DRIVER CONVENIENCE GROUP Keyless Start Remote Engine Start Heated Steering Wheel Security System Heated Front Seat(s) Power Door Locks Keyless Entry ENGINE: 3.6L V6 24V VVT FLEX FUEL (STD) Flex Fuel Capability V6 Cylinder Engine BLACK/LIGHT GRAYSTONE, LEATHER TRIMMED BUCKET SEATS Leather Seats Bucket Seats TRANSMISSION: 6-SPEED AUTOMATIC 62TE (STD) A/T 6-Speed A/T BRIGHT WHITE CLEARCOAT *Note - For third party subscriptions or services, please contact the dealer for more information. * Your buying risks are reduced thanks to a CARFAX BuyBack Guarantee. The CARFAX report for this 2016 Chrysler Town & Country Touring highlights that it's a One-Owner vehicle, and for good reason. A One-Owner vehicle gives you the feel of owning a new vehicle without paying the new car price. Give your passengers the best ride ever with a premium entertainment package. Intricately stitched leather and ergonomic design seats are among the details in which test drivers say that Chrysler Town & Country is in a league of its own Enjoy the drive without worrying about directions thanks to the built-in navigation system. This vehicle comes with an extra bonus: past service records are included. More information about the 2016 Chrysler Town & Country: The Chrysler Town & Country's 283-horsepower Pentastar V6, which includes a driver-selectable "Fuel Economizer" mode, is mated to a 6-speed transmission and uses premium low rolling-resistance tires to deliver an estimated 17 mpg city and 25 mpg highway. An impressive luxury-style interior and optional UConnect technology brings the latest in voice-activated multimedia connections, navigation and entertainment to Chrysler's premium minivan. Strengths of this model include impressive airbag array and safety engineering, Powerful engine, luxury interior appointments, electronic entertainment with dual-DVD systems, and advanced technologies with navigation.